Termites are one of the oldest insects, dating back over 200 million years. Over that time, 2600 species of termites have eaten their way through large concentrations of cellulose. 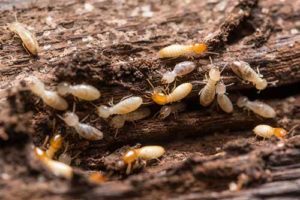 Many termite species prefer warm weather and moist conditions, so it’s not surprising that termites are plentiful in South Florida. Wondering if you have termites? Check your doorways, door frames, walls, and baseboards for termite wings by clicking here. Examine the ground near the house for tube-shaped mud tunnels. Inspect doors, baseboards and frames for tiny holes or bubbles. Determine if they are flying ants or termites by reading this. If you saw mud tubes in your home examination, you may have Subterranean or Formosan Termites. Both consume cellulose fiber and can damage insulation, paper, and wood structures. While there are other species of termites, the Formosan Termites are the most aggressive. Learn more here. What if you’ve only seen a few wings? If you’ve only seen a small clue that leads you to believe you may have a small number of termites, think again. Termites live in colonies ranging from hundreds to many thousands. If you see a few wings or a couple of tube-shaped mud tunnels, you can bet there are more – many more. What are the best home treatments for termites? Regrettably, home treatments using topical sprays don’t work. Why? They don’t reach far enough to effectively target the colonies deep in walls or wood structures. When is it time to call a pest control service? If you suspect you may have termites or have any evidence that there are termites, it’s time to call in the professionals. Allow the pest control professionals at Florida Pest Control Center (FPCC) to evaluate your home and provide a free estimate – so that you can terminate the termites before they destroy your home. Do you treat termites with “Old School” Tenting? Some pest control companies use old methods that involve tenting the home for several days, requiring that you, your family and your pets evacuate. The tenting method is invasive and costly, and we recommend against it. Florida Pest Control Center (FPCC) is the termite terminator, the Florida expert in treating all types of termites. FPCC professionals analyze and evaluate each infestation to determine the most effective treatment. Using the most advanced technologies to safely eliminate termites, FPCC pest control may recommend heat treatment, foam termicide through pumps, liquid treatment through soil rods and injections, ground barriers, or a combination of these. The one-service heat treatment strategy uses forced hot air technology to quickly eradicate termite colonies. Using specialized radiators and infrared sensors, we raise the ambient room temperature, remove moisture, and circulate heated air at specific temperatures. The heat kills the colonies, leaving no residue nor chemicals. Using the most advanced technologies to safely eliminate termites, FPCC pest control professionals treat infestations using a combination of liquid and foam termicides through pumps, injections, bait, and soil rods. FPCC uses innovative technology to create a non-repellent barrier between your building and the ground, effectively preventing new termites from entering to the ground for the moisture they need to survive. The variety of innovative treatments we use not only eliminate termites rapidly without the need for tenting, but they also create a barrier between your building and the ground, effectively preventing new termites from entering to the ground for the moisture they need to survive. Moreover, FPCC treatments won’t break the bank nor require you to evacuate for days at a time.